Pastor Mboi Andre (Pastor and President of the Union of Grace Brethren Churches in the Central African Republic) will be leaving the CAR for the USA on Thursday 12 March. Thanks to the incredible generosity of Drs. Russ Woda, Mitch Kennedy, Bruce Gray (surgical team), Ohio Health, Aiken (SC) Grace Brethren Church, GBIM (and many others behind the scenes), Andre will receive free surgical care for his non-functioning dominant hand. If all goes as planned, his surgery will be next Wednesday 18 March at 7:30 a.m. Please join us here at GBIM in praying for travel safety and a GREAT surgical outcome. This is his dominant hand and he has been significantly handicapped by this fracture. The x-ray shows a broken bone that has yet to fuse (after two months) as well as obvious external deformities. 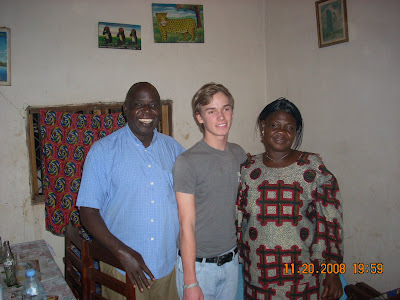 Mboi is pictured with Dan Woda (surgical team member) and Mboi’s wife, Marguerite. As soon as he is out of surgery we will give you an update. If all goes well, he will travel to several churches while in the USA. If you are interested in helping or having Andre visit, please do not hesitate to give me a call at GBIM.